Hyperparathyroidism is the third most common clinical endocrine disorder after diabetes and thyroid disease, with a higher incidence among postmenopausal women. It is commonly associated with subjective symptoms of neuropsychiatric, cognitive, and musculoskeletal origin, abdominal pain, fatigue, vomiting, and in more advanced cases, renal stones, metabolic bone derangements and even pancreatitis., Between 70% and 80% of the cases are diagnosed by the incidental detection of high levels of blood calcium in routine biochemical laboratory tests performed for other purposes. There are three types of hyperparathyroidism, the most frequent being primary hyperparathyroidism (PHPT) where high levels of parathyroid hormone (PTH) are produced in one or several parathyroid glands. PHPT is attributable to a solitary parathyroid adenoma in 75%–85% of cases; double adenomas, four-gland hyperplasia, and parathyroid carcinoma are less common causes. We report a case of occult parathyroid adenoma in a patient in whom a total thyroidectomy with central neck dissection was performed 2 weeks earlier due to papillary thyroid carcinoma. Finally, an overlooked retroesophageal parathyroid adenoma was localized by 99m Tc-sestamibi single-photon emission computed tomography/computed tomography (SPECT/CT). The technological convenience of functional and anatomic image coregistration is illustrated as it allowed us to perform an uncomplicated minimally-invasive surgery. A 53-year-old woman diagnosed with papillary thyroid carcinoma underwent total thyroidectomy and central neck dissection in accordance with our institutional treatment protocol for differentiated thyroid cancer. The preoperative neck ultrasound revealed two solid nodules in the left lobule, 0.9 cm × 0.7 cm and 0.8 cm × 0.9 cm, without adenopathy or visible parathyroid glands. Surgical pathology reported a multifocal classic papillary carcinoma with 0.9 cm and 0.8 cm tumor nodules. There was minimum extrathyroidal extension and no lymph node involvement. The final staging was AJCC/UICC T3N0M0 (TNM staging system, 7th edition). At that time, we did not routinely evaluate serum calcium levels before thyroidectomy. Postoperative laboratories showed high levels of total serum calcium and ionized calcium, of 11.8 mg/dl (normal reference value: 8.5–10.2 mg/dl), and 1.63 mmol/L (1.12–1.37 mmol/L), respectively. Other biochemical test results included intact parathyroid hormone (iPTH), 95 pg/ml (10–60 pg/ml); serum phosphate, 2.21 mg/dL (2.4–4.1 mg/dL); thyroid-stimulating hormone, 0.20 uUI/mL (0.27–4.2uUl/mL); serum thyroglobulin, 0.16 ng/ml; and antithyroglobulin antibodies, 31 U/ml (0–115 U/ml). An occult parathyroid adenoma was suspected because the neck ultrasound did not show it.99m Tc-sestamibi scintigraphy planar images depicted an ectopic parathyroid adenoma as abnormal focal uptake in the right upper mediastinum [Figure 1]a. A SPECT/CT was then performed in a 16-slice hybrid scanner (General Electric, Discovery 670). Unenhanced CT images were obtained using the following acquisition parameters: 80 mA, 120 kVp, 0.8 s per CT rotation, pitch of 1.375:1, and a reconstructed slice thickness of 3.75 mm. The CT data were reconstructed using an iterative algorithm and a 512 × 512 matrix with a transaxial view of 50 cm. An ectopic parathyroid adenoma was localized in the right retroesophageal groove at the level of the fourth tracheal ring [Figure 1]b. 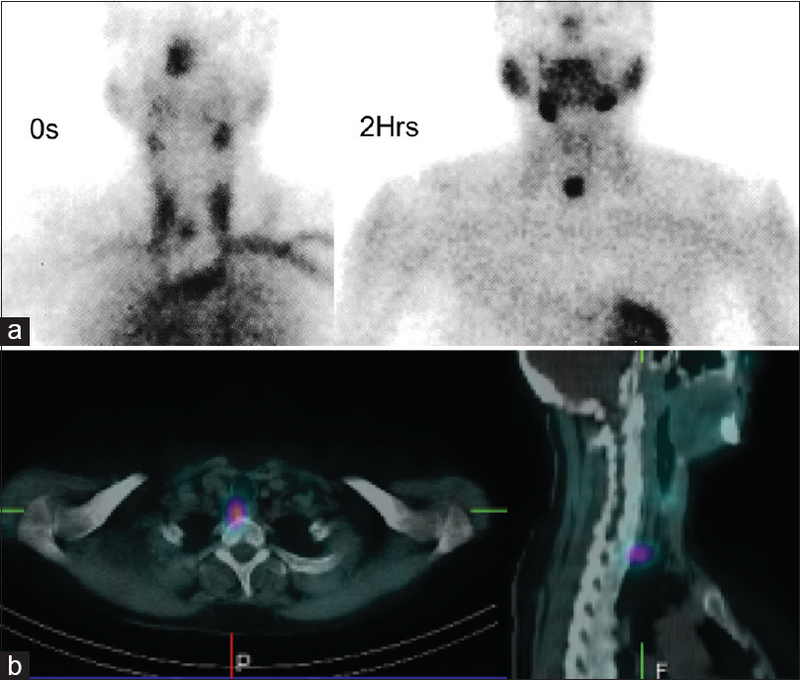 A minimally exploratory parathyroidectomy (MEP) was performed using recurrent laryngeal nerve monitoring, and the adenoma was successfully located as predicted by SPECT/CT. An intraoperative frozen section was performed to confirm parathyroid tissue in the resected specimen, in lieu of quick intraoperative PTH assay which is not available in our institution [Figure 2]a. The patient's postoperative evolution was satisfactory, and she was discharged 24 h later with no complications. The final histopathology described a 2.7 cm × 1.0 cm parathyroid adenoma, weighing 2.2 g [Figure 2]b. Agreement with our institutional treatment protocol of that moment, for locally-invasive differentiated thyroid cancer, she received adjuvant therapy with 100 mCi of radioactive iodine (RAI), and the posttherapy whole-body scan showed thyroid bed uptake and no RAI-avid regional or distant metastases. By the 4th year of follow-up, she remained disease-free, including an iPTH of 6.99 pg/ml, 1.19 mmol/L (1.12–1.37 mmol/L), undetectable levels of thyroglobulin under LT4 suppression, and negative thyroglobulin antibodies. Parathyroid gland surgery is a demanding procedure, especially in patients with previous operations of the thyroid compartment. Parathyroidectomy with bilateral neck exploration of the four glands has been the standard of care for the treatment of parathyroid disease. However, with the development of high-resolution ultrasound and nuclear medicine techniques, the surgical paradigm has shifted to that of a limited parathyroid surgery., Minimally invasive parathyroidectomy (MIP) is now the typical treatment for patients with image-localized presumably single-gland PHPT. James et al. argued that MIP is too generic to be useful and proposed a new taxonomic format to describe limited parathyroid surgery based on four descriptive categories: (operative approach), (# of glands explored), parathyroidectomy using (operative adjuncts) under (anesthesia type). To the best of our knowledge, any parathyroid resection carried out under limited exploration criteria should be better designated as MEP, a reasonable surgery for PHPT. Less dissection results less edema and less devascularization of the surgical bed, which in turn leads to faster recovery and shorter hospitalization time. Despite a large size (3 cm), the retroesophageal adenoma in our patient was not readily detectable to the naked eye, even after looking at the SPECT/CT images. Although it was clearly depicted by the initial 99m Tc-sestamibi planar and SPECT images, only SPECT/CT provided enough detail to perform an MEP with no complications. Finally, although thyroidectomy and parathyroidectomy were performed 2 weeks apart, the two lesions were present at the same time. We can conclude that our patient suffered a hidden parathyroid adenoma and concomitant thyroid papillary carcinoma, because the pathology of both surgeries established these diagnoses. Before thyroidectomy, patients should be evaluated with serum calcium, to rule out concomitant hyperparathyroidism. The general advantages provided by MEP and MIP are lower incidence of hypocalcemia, less pain, small incisions, and better cosmetic effects. In addition to short surgical procedures with briefer and less expensive hospital stays. The 99m Tc-sestamibi parathyroid scintigraphy with SPECT/CT is a very useful diagnostic tool in patients with occult parathyroid adenoma. Gasparri G. Updates in primary hyperparathyroidism. Updates Surg 2017;69:217-23. Fraser WD. Hyperparathyroidism. Lancet 2009;374:145-58. Foroulis CN, Rousogiannis S, Lioupis C, Koutarelos D, Kassi G, Lioupis A, et al. Ectopic paraesophageal mediastinal parathyroid adenoma, a rare cause of acute pancreatitis. World J Surg Oncol 2004;2:41. Shindo M, Lee JA, Lubitz CC, McCoy KL, Orloff LA, Tufano RP, et al. The changing landscape of primary, secondary, and tertiary hyperparathyroidism: Highlights from the American College of Surgeons panel, “What's new for the surgeon caring for patients with hyperparathyroidism”. J Am Coll Surg 2016;222:1240-50. Laird AM, Libutti SK. Minimally invasive parathyroidectomy versus bilateral neck exploration for primary hyperparathyroidism. Surg Oncol Clin N Am 2016;25:103-18. James BC, Kaplan EL, Grogan RH, Angelos P. What's in a name? : Providing clarity in the definition of minimally invasive parathyroidectomy. World J Surg 2015;39:975-80. Wong KK, Fig LM, Gross MD, Dwamena BA. Parathyroid adenoma localization with 99mTc-sestamibi SPECT/CT: A meta-analysis. Nucl Med Commun 2015;36:363-75. Oliver Guillén JR, de la Cueva Barrao L, Miguelena Bobadilla JM, Giménez Maurel T, Hernando Almudí E, Casamayor Franco MC, et al. Cystic parathyroid adenoma: Primary hyperparathyroidism without 99mTc-MIBI uptake. Rev Esp Med Nucl Imagen Mol 2017;36:254-6. Mahmoodzadeh H, Harirchi I, Hassan Esfehani M, Alibakhshi A. Papillary thyroid carcinoma associated with parathyroid adenoma. Acta Med Iran 2012;50:353-4. Calò PG, Medas F, Loi G, Erdas E, Pisano G, Nicolosi A, et al. Feasibility of unilateral parathyroidectomy in patients with primary hyperparathyroidism and negative or discordant localization studies. Updates Surg 2016;68:155-61.